To track the campaign’s progress, including the latest polling, see James in Turkey’s separate page here. At the end of 2016, the governing Justice and Development (AK) Party announced its plans to abolish the position of prime minister and vest all its powers in the country’s presidency, currently occupied by Recep Tayyip Erdoğan. Sweeping powers to appoint governors, civil servants, judges and officials from the president’s political party, all concentrated in a single office. The 18 articles are the result of painstaking negotiations with the right-wing Nationalist Movement Party (MHP), whose leader Devlet Bahçeli unexpectedly reversed his party’s opposition to a so-called “executive presidency” and provided the AK Party with the votes it needs to get the proposal through parliament. Opposition parties – the social democratic CHP and pro-Kurdish HDP – have said they will vote against the proposal. Under the proposal, the prime minister’s position will be abolished and the government will no longer need a vote of confidence in parliament. Under the proposals, Turkey’s most senior judges would all be selected by politicians – and most of them by the president. There are sweeping reforms to the Hakimler ve Savcılar Yüksek Kurulu (HSYK), the body that admits judges and prosecutors into the profession, allocates them to specific courts and takes any disciplinary action against them. Under the changes the judiciary would be stripped of the right to pick any of the HSYK’s members. Instead, the government wants to shrink the body to 13 members and share the responsibility for filling the roles between parliament and the president. Each will have six members to appoint as the seats become vacant, with the justice minister additionally appointing his own undersecretary. The irony is that the changes are a reversal of AK’s earlier reforms that were endorsed in a referendum six years ago, promoted at the time as an attempt to give greater independence to the judiciary. But the 2016 proposals are significant for another reason: the power pooled in the presidency. Alongside the HSYK, the Turkish president is responsible for appointing 14 of the 17 members of the Constitutional Court – the highest judicial body in the land. It means Turkey’s president will now be directly responsible, without any external oversight, for appointing two-thirds of the country’s 39 most senior judges. Powers to propose the country’s annual budget shift from ministers to the president. Some restrictions, such as on retrospectively amending the budget, are loosened. Scrutinised by A budget committee contained a majority of government members, but all parliamentary parties represented A budget committee. Previous references to composition now removed. Overspends Not permitted. Ministers cannot unilaterally decide to overspend. Not permitted. The president cannot unilaterally decide to overspend. Budgetary amendments Minsters cannot amend a budget by decree after it has been accepted. Reference removed in proposed system. No such restriction on president. Final accounts Submitted to parliament seven months after fiscal year-end. Submitted to parliament six months after fiscal year-end. Article 98 of the present constitution equips parliament with five mechanisms to hold the government to account. The proposed changes would see some of these abolished and others watered down. A widely-held principle of parliamentary democracies is the vote of confidence: governments must command the support of a majority of the legislature. If they lose that majority, they fall. Turkey’s proposed presidential system would remove this principle and replace it with a mechanism that needs more MPs to vote for it and more time to complete. The gensoru (censure motion) is the present mechanism used by members of parliament wanting a probe and eventually to trigger a vote of confidence in any minister, including the prime minister. A successful gensoru can result in the individual or the entire government being toppled. It must take no longer than 18 days to work through all its stages. Under the AK Party / MHP proposal, the censure motion will be abolished and replaced with a soruşturma (investigation) that could take as long as 10 months to be completed. Only ministers and vice-presidents will be subject to this mechanism. Under the current system, there is only one crime the largely symbolic president can be impeached for: treason. A full three-quarters of MPs must vote to topple him, making it one of the highest thresholds in the constitution. The AK Party / MHP proposal replaces all references to treason with the words “a crime”. But it requires a majority of MPs to propose an investigation against him, whereas treason motions can currently be tabled by a third of lawmakers. The proposal also dictates that he must be tried by the 17 judges of the Constitutional Court, sitting as the Yüce Divan – Supreme Court. Under the AK Party’s successful judicial reforms of 2010, 14 of that court’s judges are already appointed by the president. 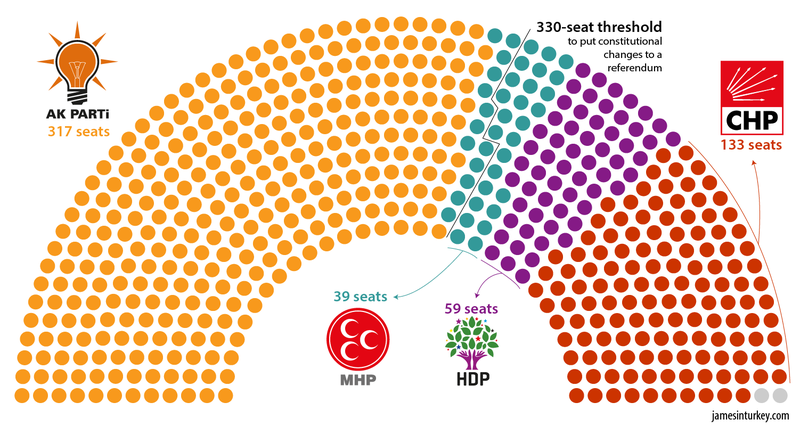 All 316 AK Party MPs have signed the proposal, but changes to the constitution require the support of at least 330 MPs if they are to be put to a popular referendum. The Speaker cannot vote, meaning the AK Party needs the support of at least 15 MHP MPs to reach the threshold. Since the AK Party’s proposals were first published in December 2016, several clauses have been dropped and amended. Most changes have been minor but some – such as the abolition of a system of reserve MPs – were not. This page reflects the proposals in their most recent form; to see the original James in Turkey page from 12 December 2016 in its archived form, click here.